Killarney and the Ring of Kerry are known the world over and represent all that is best about Irelands relaxed way of life and magnificent scenery. The area is home to great attractions and vistas, from the MacGillycuddys Reeks Mountain Range, to historic castles, stately homes and ancient woodlands of Killarney National Park. Travel to fishguard for our ferry and onto dooleys Hotel Waterford for our overnight stay. Travel on to county Cork, where it is possible to kiss the Blarney Stone, before continuing to County Kerry into county Kerry, to Castleisland, our base for the next 3 nights. 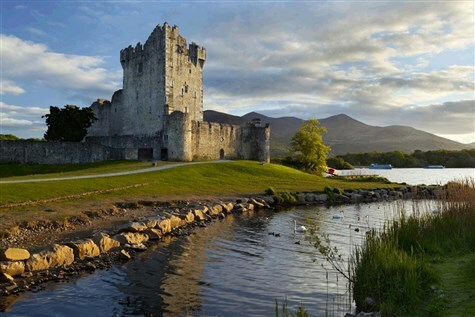 Killarney, Jaunting Car Ride and Lake Cruise: Spend time in the tourist town of Killarneyand enjoy a traditional jaunting car ride through the National Park to Ross Castle, followed by a scenic lake cruise. Ring of Kerry: A highlight of the tour. Formed during the last Ice Age, the picturesque peninsular, with its traditional villages, lush countryside and ocean views, makes it a wonderful coastal drive. From Kerry we travel to County Cork, and visit Cobh, a tiny fishing village with a big history made famous as the last port of call for RMS Titanic. After a few hours we continue our journey to Waterford, dooleys Hotel for our final overnight. We catch the morning ferry from Rosslare to Fishguard and continue homeward. A lovely family run hotel situated in the heart of the market town of Castleisland. All en-suite rooms have TV, telephone and room service. The hotel has a restaurant, lift, bar and grill.